—The opening of the striking new facility for the Museum of Arts and Design (about which I will post more later). The ribbon-cutting ceremony with Mayor Bloomberg is at 11:30 a.m. today. The museum opens to the public Saturday. —The expected easy approval at tomorrow’s City Council meeting of the Whitney’s downtown expansion project. That’s the final step in the unusually opposition-free public review process for the Renzo Piano facility. This means that if they can sign the all contracts and come up with the cash, construction work (expected to begin this spring) is good to go. Maybe NOW they’ll be willing to tell us how much they’ve raised towards the $680 million and to give us more details about what the building will look like and how it will be used. —The announcement, expected to hit inboxes late this evening, that the Solomon R. Guggenheim Foundation’s board, which is meeting later today, has officially chosen Richard Armstrong to be its next director, succeeding Tom Krens. Armstrong spent two hours yesterday chatting with board members, some of whom had not previously met him. —Last night’s ribbon-cutting (also attended by Mayor Bloomberg…and by me) for the completion of the three-year restoration of the Guggenheim Museum’s iconic Frank Lloyd Wright building. 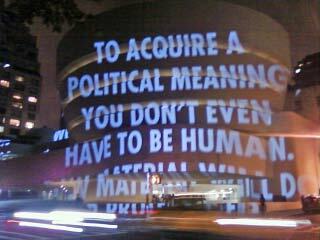 It looks gorgeous, particularly when clothed in a Jenny Holzer site-specfic, scrolling projection (above), switched on yesterday and being shown every Friday evening through Dec. 31. Please, Richard, make it more than just once a week! —The announcement that Brooklyn artist Tara Donovan (below) was one of this year’s winners of the MacArthur Foundation’s $500,000 “genius” fellowships. (The other artist-winner is South Carolina basket maker Mary Jackson.) In a case of unfortunate timing, the Metropolitan Museum closed its site-specific installation by Donovan just two days before the honor that should stimulate more public interest in her work. One of her sculptures, “Bluffs,” composed of buttons, is included in the inaugural display at the Museum of Arts and Design (but the artist’s dealer, PaceWildenstein, wouldn’t allow the press to photograph it or other works by that gallery’s artists). You can see images from the Met show here, but the photos don’t even begin to give you a sense of this piece. You had to be there; now you can’t.